I recently took a trip to Tokyo and this was my first real opportunity to test out the paces of the Leica SL with my travelling needs. I like to travel light and with not much camera gear as I feel like travelling and walking the metro streets will be bogged down should I have too many things to carry. With my Leica Q it was truely a travel camera and was a joy to work with thus with the move to the Leica SL this really was my first test to determine if I would regret having the Q with me. For those of you who have been to Japan know that spaces are tight, streets are packed and commuting is a rush, thus I knew that this trip and my experience with the Leica SL would validate how I feel about the camera 6 months into my partnership. I spent about 5 full days in Tokyo, and moved around from Ginza, Shibuya, Harajuku, Ometosando etc, plus having my two three year old twins to cater to along the way. Overall, all the hesitations I had going into the trip with the Leica SL were non-issues and I will talk about what a joy it was to use the Leica SL in Tokyo below. First thing I want to address is using the Leica SL in full manual mode, having the luxury of auto focus on the Leica Q, I had my hesitation of missing the shots I was looking for with going full manual. I did not use native SL lenses with auto focus due to the size of the current lenses available, this will be another topic for another day when the Summicron lineup of lenses come about. Overall once you get your bearings on manually focus it not that bad at all. You can actually focus faster with manual focusing at times if you use focus zone techniques. Walking around Tokyo city with so many people in a hurry to get to their destination, I never really had any issues of missing the shot in front of me. Its actually a joy at times to stop and plan out your what you want to focus on, it probably has even helped me think about the composition a little better. The focus peaking of the SL its hit or miss sometimes so I tend to use the zoom in functionality more to nail the accuracy of what I am trying to focus on. The next item I want to discuss on my trip was the image IQ, the SL is really just fantastic in terms of the image quality produced. The detail and just the colors and tones produced by the camera are always a joy to see once I load my shots onto my PC. There really nothing I can say about the image quality of the Leica SL, in all honesty the Leica Q had superb IQ but every once and a while there was something I just did not like about the image from the Leica Q. It does tend to render colder images as compared to the Leica SL which produces accurate and warm colors. There is just a mood of the way the camera renders a particular image. Overall the SL exceeded my expectations with usage in Japan. I fell in love even more every time it nailed what I wanted to do in the small streets of Japan. Never was I frowned upon or given the dirty look for pointing a fairly larger camera in their direction. For the most part I was unnoticed while taking pictures and this is a good thing moving considering I moved from the Leica Q which was small and silent. Walking the streets the camera just worked. The colors were super accurate, auto white balance was fantastic dealing with constant light changes of Japan, and image tones were always superb. The Leica SL lived up to the paces of Japan and make me want to do more with the camera. Cars, taxis and trucks are impeccably clean. No wonder taxis and cars are subjects for some great photography. 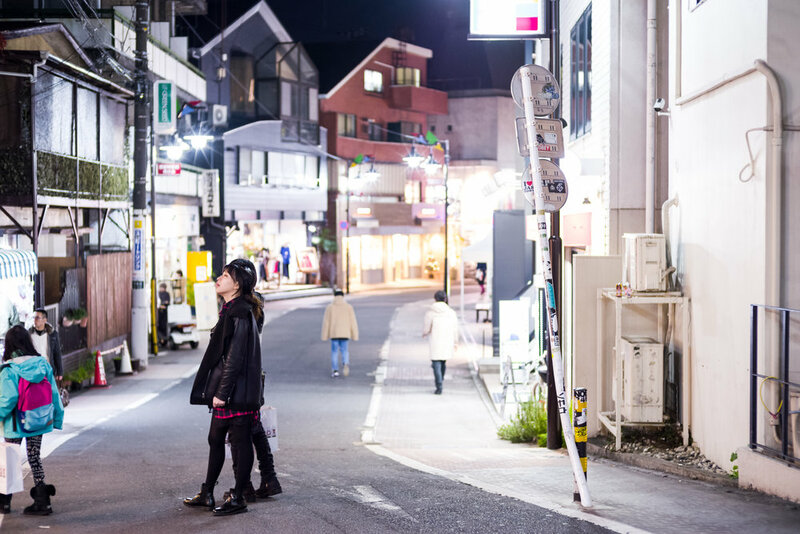 Residents of Japan love to dress up and be playful with their outfits, you really cannot walk down a few streets without finding someone interesting. Old tiny streets meet the large modern architectures. Japan is both so advanced but at the same time appreciative of old things. Its just fantastic to see how the two mix. Bright lights fill the streets, anywhere you go its just screens and LEDs in your face. The people of Japan are also another pleasure to meet, respect is such a big thing in Japan and you see it all across the city. The way business, retail and social interactions are handled are all rooted with ensuring your respect the other party. Its always a great joy to be in Japan because of the people you meet and interact with. In my three trips to the country, never have I felt any shadiness or uncomfortable feelings with any person or place, it just always feels like a place of peace and honesty. I could be lost and just trying to figure out directions myself but 9 of 10 times someone would go out their way to see if I needed any help. One thing you will notice when travelling to Japan is that colors are a little bit different due to the tones on the streets. Golden hours are harder to find because of all the skyscrapers so you get more of a blue hue from all the LEDs and televisions that cover the streets and buildings. This gives you a different tone to your images but not in a bad way. One thing for sure is that low light images in Japan are not an issue given the amount of ambient light that covers the streets. Never did I have an issue with low light and street photography. Reflections are abundant and one of the nicest things to capture in Japan, everything always feels like its chrome and just shining right back at you. Cars are clean, streets are dirt free, buildings and windows impeccable. Combine this with screens that are shining bright and you can find multiple POVs for a photo your trying to capture. In summary, travelling to Tokyo with the Leica SL was truly a joy. The camera just works, the EVF is amazing as always and just the ergonomics of the camera in your hand just work. A single battery lasted the entire day of me shooting, body is weather proof and the camera IQ and tone are just amazing. In the 6 months that I have owned the Leica SL this has been the first trip that I can validate how it can meet my requirements for travel photography. It is heavier than my Leica Q but never really did I notice the weight difference. The Image IQ, weather sealing and pro features outweigh the benefits of traveling light with the Leica Q. It surely does not help that I was in Japan, a dream location to take a camera thru the rigors, but so far it has lived up to my expectations and exceeded them.